Are you looking for great a great holiday gift that helps provide toxic-free beauty? A green beauty guide may be the way to go. Looking fabulous should never be at the expense of good health. The Green Beauty Rules: The Essential Guide to Toxic-Free Beauty, Green Glamour and Glowing Skin (HCI Books -- $21.95) by makeup artist to the stars Paige Padgett, bridges the gap between No More Dirty Looks and Bobbi Brown beauty books. 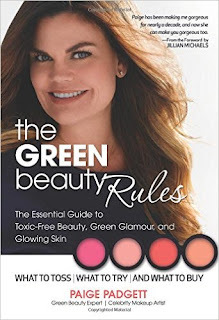 Paige helps women seamlessly 'green' their beauty routines with a step-by-step guide and a sample clean beauty routine that offers approximately 200 chemically-safe beauty products, all ranking 3 or lower on the Environmental Working Group's Skin Deep Cosmetic Database. This beautiful gift guide, packed with tips and tricks to get a toxic-free, gorgeous makeup look, is sheer luxury on a budget and makes a great holiday gift for friends and family who will learn how to create a glamorous holiday look – safely!